Over 15 million root canals are performed annually. While they are common, they are only used as a last resort. When a tooth has suffered significant decay or infection, less invasive treatments are no longer enough to restore its health. 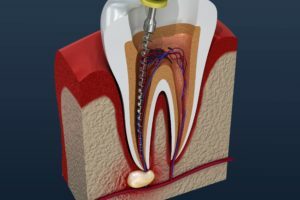 The only viable solution to save your tooth from an extraction is root canal therapy, which should be performed as quickly as possible. Pain when chewing or placing pressure on a tooth. A small pimple-like bump that appears near the gum. Tenderness or swelling on the gums near the tooth. Your dentist schedules you for your root canal after your initial consultation. A local anesthetic is administered to minimize any discomfort before they remove any area of damage or decay. The inner layer of the tooth, known as the pulp, is extracted through the crown. Your tooth is then sterilized and sealed using a special material called gutta-percha. This process rehabilitates its health; however, its structure remains compromised. To protect the integrity of your tooth, a custom-made dental crown is placed over it. This gives an added layer of protection while also improving its function and appearance. An impression of your mouth is used to craft the cap to match your exact size, shape, and color needs to blend in with your natural teeth. After your procedure, it is normal to experience some pain and tenderness for a few days, but it will subside. It is best to avoid chewing on your tooth until your discomfort stops. You can use over-the-counter pain relievers to manage your pain. Don’t chew overly hard or sticky foods with the crown. Don’t chew on inedible objects or use your teeth as tools. If you need a root canal, do not risk the health of your smile. Your dentist will save your tooth using the endodontic procedure. Allheart Dental Implants & Orthodontics provides advanced dental services from our modern dental office. We provide root canals in Arlington to save damaged teeth. Contact our office today to schedule your consultation.